If you’re a homeowner, you likely have a few trees on your property. Someday – perhaps today – these trees need to be cared for. The question is: should you trim these trees yourself or hire a professional? The answer depends on the kind of person you are. Do you like working with your hands? Are you good with tools? Are you willing to take the proper tree trimming safety precautions and preparations? If the answer to all the above is “yes,” by all means, trim (most) trees by yourself. To help you do this, I’ve put together a detailed post about how to trim many of the most popular trees in the Dallas – Ft. Worth area. First, why trim or prune trees? There are many reasons. 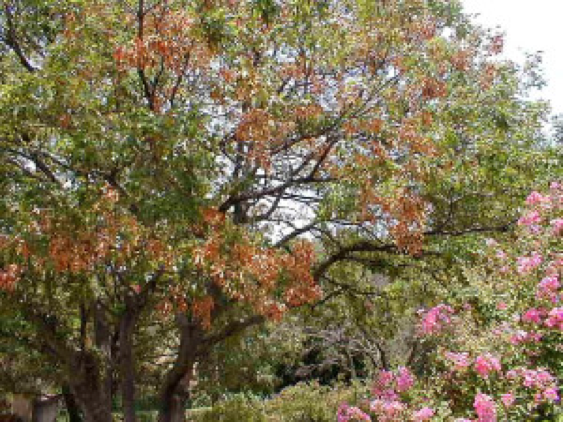 Tree trimming can spur growth, such as fruits or foliage; if a tree is pruned in the summer, it can limit regrowth in the spring. Trees can be trimmed for aesthetic purposes as well as for safety. When should you trim your trees? While trees can be trimmed year round, generally speaking the best time is in late fall through early winter when the tree is dormant. Trees younger than two years should not be pruned as it can stunt their root growth. Dead or dying branches can be removed at any time. NOTE: Do not prune Oak trees between February and June due to the dangers of spreading oak wilt. For larger branches, you’ll need a handsaw, or chainsaw. More complicated (and more dangerous) trimming can be accomplished with a pole saw. 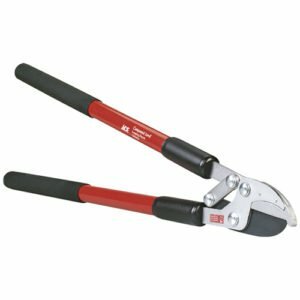 For pruning branches less than an inch, you’ll need a good pair of pruning loppers; for larger ones turn to a pruning saw. This is where we get into safety concerns. You should ALWAYS have a good pair of leather work gloves. 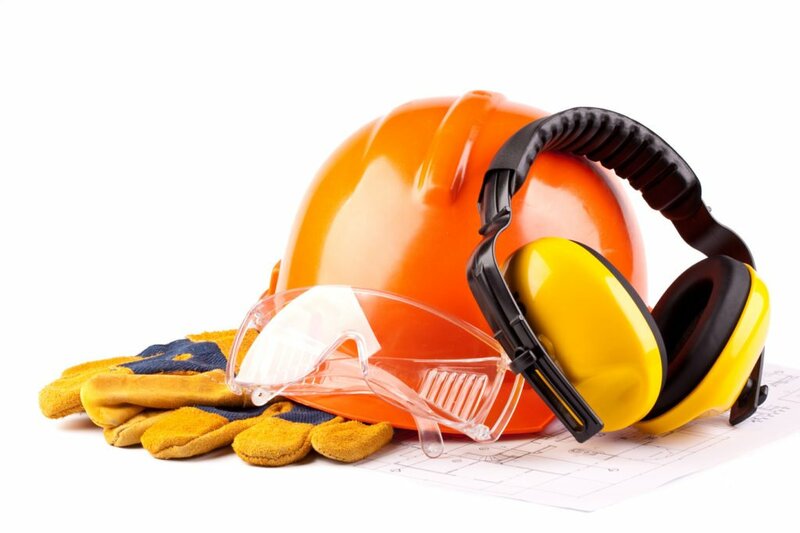 When working with saws, you should also add a pair of safety glasses as well as a hard hat, since you are likely cutting larger branches that could potentially hit you in the head. Your trimming job may now also involve ladders, in which case you likely need a partner to insure safety. It would be a good idea to have some kind of work shoe or boot, a heavy pair of jeans, and long sleeve shirt. Dress like a lumberjack! 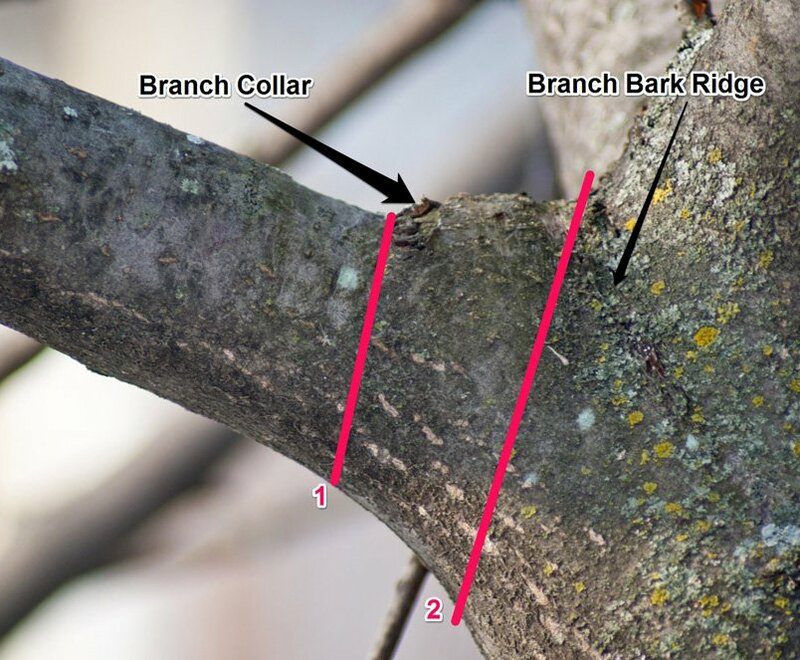 The ideal spot for removing a branch is just above the collar, where it joins with the tree. A clean, downward angled cut will allow the tree to form a callus, which protects it from becoming sick or infested. Unlike a scab, a callus stays with the tree for its entire life. For branches larger than 1 inch diameter, you are going to want to make three cuts – not one – to ensure it is removed in such a way that it doesn’t adversely harm the health of the tree. Step One: locate the branch collar and measure 8 – 12” inches (it doesn’t have to be exact). Make an cut halfway through the tree on the underside of the branch. This is known as an undercut. Step Two: About 3 or 4 inches past the undercut, make a cut all the way through the branch. This will cause it to fall off, and the undercut prevents it from ripping down and damaging the trunk. Step Three: Make the final cut just on the outside of the tree collar, all the way through, at a downward angle; this will prevent water from accumulating inside and causing tree rot. Trim trees near power lines – call an expert! 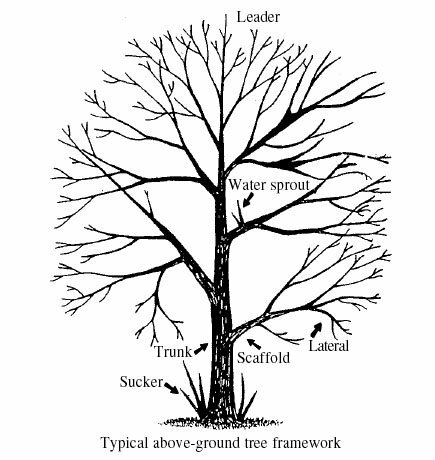 If you haven’t been paying attention to your tree, there may be all kinds of sucker branches growing straight up from the roots; water shoots also sometimes appear coming out of the trunk. These suckers are no good and should be cut away completely, with the best time to do it being in the spring. To remove water shoots, use pruners to cut as close to the bark as possible. Bypass loppers should be used on sucker branches, cutting as close to the base as possible. If you see any regrowth, don’t be afraid to stamp them out with your foot. Yes, these suckers are bad! Once the suckers and dead branches are gone, you should inspect the tree for disease. If it’s a fruit tree, keep an eye out for fire blight, whose symptoms include wilted leaves and bark that looks charred. If it’s an oak tree, keep your eye out for oak wilt. If you do spot a diseased tree branch, care must be taken not to spread it to other parts of the tree or other trees in the area. As such, you need to take extra precaution. 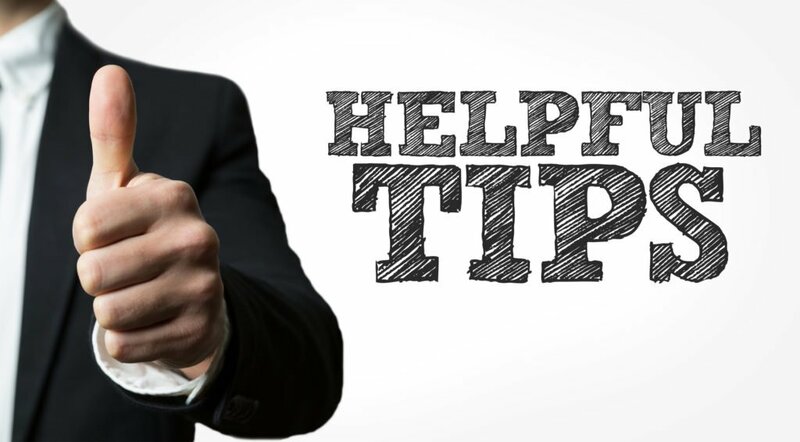 After coming in contact with the diseased part of the tree, tool blades must be wiped off with rubbing alcohol before touching other branches. Additionally, the sick branches should be immediately removed from the area in a trash bin, or burned. If it is a tree with oak wilt, you should also dress the wound with pruning paint, which will prevent the bark beetle from entering and spreading the disease. If you have a fruit tree and would like a bumper crop in the summer, the best time to prune is in late winter when it is still dormant. After removing dead branches, suckers, and finding/removing diseased branches, look at the overall shape. Fruit trees are happiest when they are no more than 6-8 feet in height and shaped like an oval, with lots of light coming through the center; this will allow it to bear lots of fruit! Next, begin removing or trimming branches about 8 feet high or taller, using pruning clippers for smaller branches and a pruning saw for larger ones. Be on the lookout for V-shaped branches, which are more likely to split, causing damage to the tree. Remove the weaker side of the V.
Be careful not to overdo it! Take it slow, step back and look at the tree from different angles to make sure you don’t make it lopsided! Remove twigs budding towards the inside of the tree. Pruning and trimming trees is somewhat of an art form. It’s best to start out slowly, as you could do damage to the tree, your property, or yourself. Be sure you have the right tools that have sharp, clean cutting edges. When dealing with trees, you don’t want to tear or damage the trunk. While they do not feel pain, they are living creatures that respond to stimuli and can be traumatized by a shoddy trimming. One of the biggest mistakes people make is raising the canopy too high by cutting off the big lower branches. This results in ugly “broccoli” trees that are more likely to become unstable. Another mistake, sometimes called the “Texas chainsaw massacre,” is when large trees are reduced to 2 or 3 branches. Trees attacked in this manner often have vigorous growth, but the weaker limbs are more susceptible to being torn off in a storm. Tree trimming is something the average homeowner can do, so long as they have the right tools and take important safety considerations. However, there are times when it makes sense to call an expert. If you do need to call an expert reach out to us at (469) 706-9832 or email info@dfwtreeservices.com.